Foreign Minister AH Mahmood Ali has met Indian External Affairs Minister Sushma Swaraj and both the ministers recalled their association with the late Prime Minister Atal Bihari Vajpayee. The meeting was held in New Delhi on Friday evening after the funeral of the former Prime Minister of India Atal Bihari Vajpayee in New Delhi. 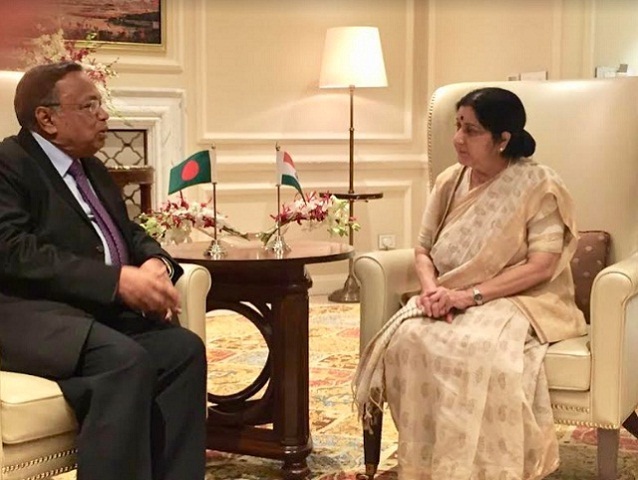 The India External Affairs Minister appreciated the Foreign Minister of Bangladesh for going all the way from Dhaka to attend funeral in New Delhi, said the Bangladesh High Commission in New Delhi on Saturday. Sushma Swaraj also appreciated Prime Minister Sheikh Hasina for her message of condolence. Both the ministers recalled their association with the late Prime Minister Atal Bihari Vajpayee. They also expressed satisfaction on regular high level engagements among the leaders of the two countries and hoped to meet each other in other forums as well. Earlier, the Bangladesh Foreign Minister personally conveyed the deep condolences of the Prime Minister of Bangladesh to the Indian Prime Minister Narendra Modi and other Indian leadership at the cremation ground. Bangladesh High Commissioner Syed Muazzem Ali accompanied the Foreign Minister both at the funeral and the bilateral meeting.